Enjoy peaceful mountain living in this impeccable home on 2 beautifully landscaped gentle acres on a quiet private drive. As you enter the foyer, admire the 180 degree views through the wall of windows in the open concept great room with vaulted ceilings & log beam accents. The kitchen is tastefully appointed with a large granite island & new stainless steel appliances. The double sided stone fireplace opens into the main floor master suite that includes a spacious 5 piece bath & closet you can get lost in! This home is located in the Homestead neighborhood, which is desirable for its location of just a quick 30 min commute from downtown & the Tech Center. Snow day? No problem. Work from home in your executive office with tons of natural light. 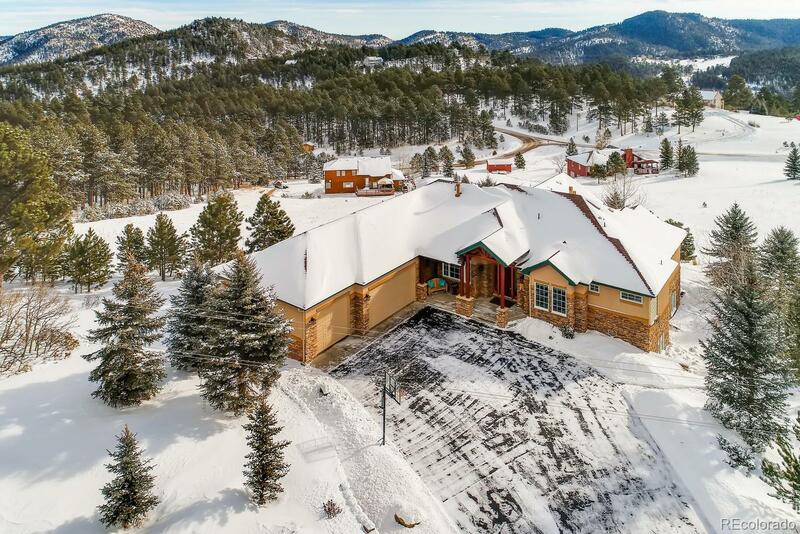 Entertain friends in the rec room below with a game of pool next to the bar, or enjoy a cold drink while marveling at the stars from the bubbling hot tub after a day of outdoor adventures in the mountains. This is a great place to call home!